At their Tuesday meeting CAEB discussed “National Novel Writing Month” (NaNoWriMo) which it has has competed for the last four years. CAEB also talked about the upcoming Club Day for Nov. 17th. The NaNoWriMo is an annual internet-based creative writing project that requires a person to write 50 thousand words in the month of Nov.
CAEB Pres. Justin Nicholson mentioned that there has been a longstanding rivalry against the country of Sweden in this competition. This was based on an amount of people who sign up for the NaNoWriMo and not on the population size. 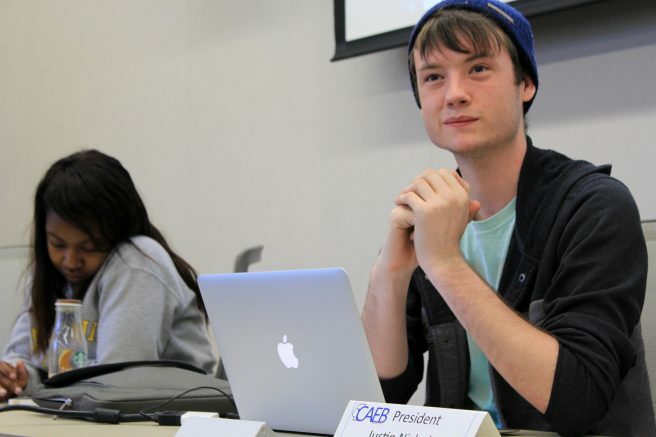 CAEB Vice Pres. Valencia Scott suggested a prize could be given for the best story. The prize will be brought up for talks within the next meeting. “Starting next Tues. we will begin writing,” Nicholson said. The other topic of the meeting included the upcoming Club Day in two weeks from this Thurs. CAEB director Ashlee Nicholson suggested game ideas, such as getting a ping pong ball into a cup and another game involving chewing gum and whipped cream to make a bubble. “We also thought about Pumpkin Bowling,” Nicholson said. Be the first to comment on "CAEB to compete in writing contest"